The Noseminster family is in Anaheim for the 2019 NAMM Show, and we’re STOKED to show you what’s new. Between version 2.0 releases and brand new models, we have a total of seven new pedals for NosePedal and Westminster Effects! We’ll edit this post as more demos are posted, so let’s get started. Edwards Overdrive V2 – Totally reimagined circuit, while still remaining true to the classic Bluesbreaker vibes of the V1 Edwards. We’ve added a Presence cut knob to increase the versatility even more. 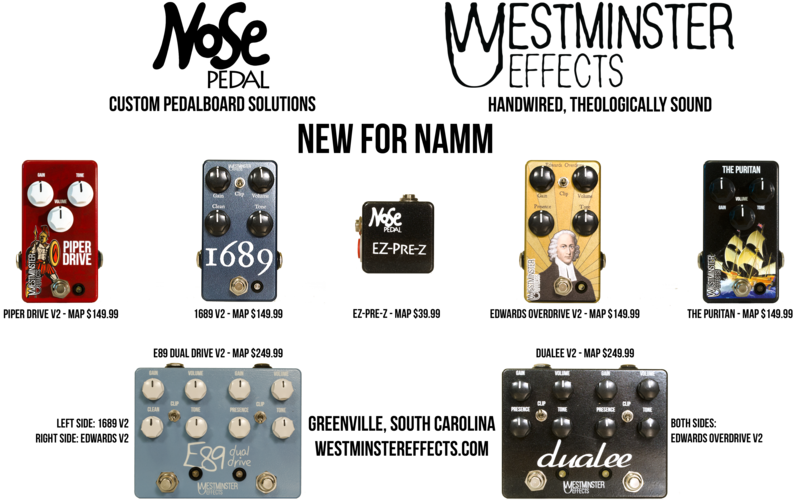 1689 Overdrive V2 – We guess the V2 makes it closer to the true 1689. This also has a totally reimagined TS style circuit, now complete with a clean blend! The Puritan – Imagine cranking an AC style amp, throwing a treble booster in front of it, and shrinking it down into a box. The Puritan is great for lead lines or as a second or third stage, nontransparent overdrive. Piper Drive V2 – The Piper Drive V2 features a totally revamped circuit for greater clarity, more sparkle when you want it, and a greater gain range – including some glitched out tones when maxed out. EZ-Pre-Z – For guys who just want a touch more, whether for thin sounding guitars, effects loops that lose a little something, and when a buffer just won’t cut it, enter the EZ-Pre-Z. It’s a tiny 2-inch-by-2-inch, always-on preamp/boost that fattens your tone with about 4db of extra push. Place anywhere in your chain, but it sounds especially awesome in front. Simple. EZ-Pre-Z.